This section provides information on how the National Blood Authority (NBA) ensures that Australians have an adequate, safe, secure and affordable supply of blood and blood-related products. The NBA does this through several measures, including the annual development of a National Supply Plan and Budget (NSP&B) and the negotiation and implementation of Blood Supply Contracts. The national blood supply is a national scheme for the subsidised supply of blood products into the Australian health sector. As such, it is similar to other national health subsidy schemes such as Medicare, the Pharmaceutical Benefits Scheme, the Aged Care Scheme, the Hearing Services Program, and the National Diabetes Services Scheme. 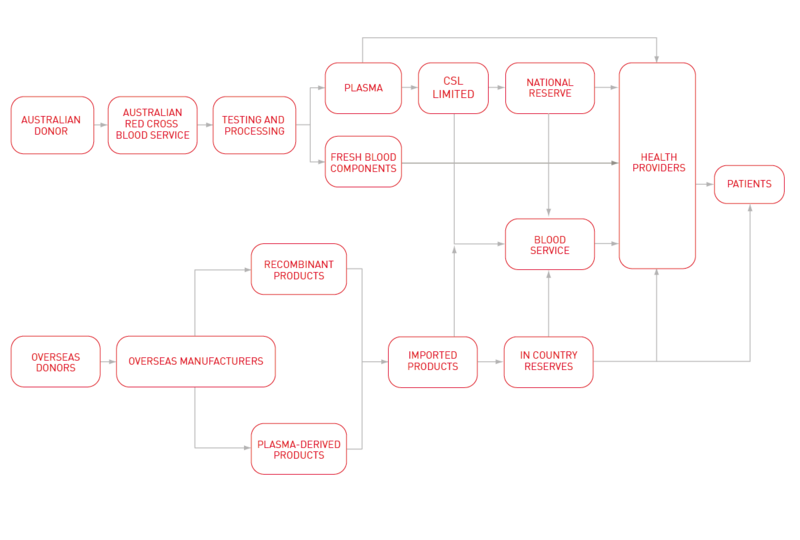 The blood supply chain in Australia from donors to patients is outlined in the image below (click on image to enlarge). method for the delivery of the subsidy, through centralised supply contracts agreed and administered by the NBA, operating within the Australian Government procurement and financial accountability framework. The national blood supply is wholly government funded (no co-payment mechanisms apply), with nine governments providing $1,204.1 million in 2017/18 to the NBA for the management and purchase of blood and blood products. 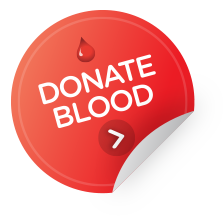 Under the scheme, blood and blood products are ultimately provided free of charge to patients in Australia. Under the National Blood Agreement, the NBA is responsible for undertaking annual supply and production planning and budgeting, in consultation with funding jurisdictions and suppliers, and for the approval of all health ministers through the Council of Australian Governments (COAG) Health Council (visit Governance Arrangements and Key Stakeholders for more information on NBA stakeholders). 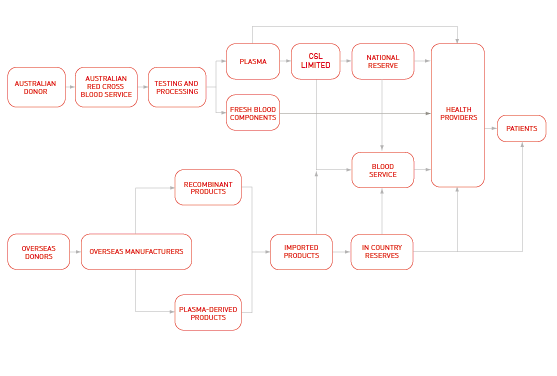 Each year the NBA prepares a National Product Price List and National Supply Plan and Budget (NSP&B) for blood and blood products. This annual development is a critically important function for the blood sector as a whole and underpins much of the NBA’s work. The NBA is also responsible for collecting data on products issued, reporting to jurisdictions against the approved supply plan, and for making improvements to the national supply planning process. Each year, the NBA has introduced more sophisticated demand modelling processes as it improves its knowledge and understanding of the products and clinical environment. In supply planning process each year, the NBA analyses volumes issued, combined with information/intelligence from suppliers, IT systems (e.g. BloodNet) and states and territories to inform the volume forecast for the next financial year. These volumes are costed and submitted to the Jurisdictional Blood Committee for approval. The NSP&B is then submitted to health ministers who have final approval of the NSP&B. In January and February a mid-year review is undertaken. This process looks at how the current financial year is tracking compared with the full year budget (NSP&B). This provides jurisdictions with a view of where the year-end figures may be and allows for adjustments in planning for commercial suppliers and the Australian Red Cross Blood Service. Once the financial year is complete the NBA undertakes a full reconciliation process to ensure jurisdictions only pay for the products that they have been issued, rather than forecast demand. To fulfil this function, the NBA monitors the balance between supply and demand throughout the year and is responsible for the intensive management of products in short supply. For example, intravenous immunoglobulin (IVIg) and Biostate (a CSL plasma derived FVIII product for treating haemophilia) and cytomegalovirus immunoglobulin (CMV) have been under intensive product management at various stages since the NBA commenced.